Ah, babies – for such little beings they require so much stuff! Don’t be too overwhelmed by what’s ahead when it comes to prepping for your newborn, just work your way through our top eight essential buys and you’ll be sorted in no time! It’s imperative you spend a good amount of time researching your baby’s car seat. Ensure that it meets strict Australian standards and consult the national guidelines. If you’re keen make your car seat part of a travel system, you’ll need to consider if it works with the pram you’re buying. Before the big day arrives, you’ll need to install the car seat in your vehicle, and if you’re not confident, seek out a qualified installer. Also make sure you practise getting the seat in and out of the car – there’s nothing worse than doing this for the first time in the hospital car park! Find a cot that’s both beautiful and functional. Invest in a convertible cot that will start out life as the perfect nest for your newborn, and later convert to a toddler bed. It makes the big bed transition so much easier, and will save you money in the long run. Go for a classic style, so it will work with any nursery theme. You can always add personalised accents around the nursery once your baby is born, but start with a neutral, quality blank canvas, and the final product will look all the more amazing. The Nostalgia Sleigh Cot Bed does more than just double duty in a nursery! Not only is it a cot that converts into a toddler bed, but it can also be used as a day bed later on. And there’s a handy storage drawer underneath. It’s perfect for sheets, and very handy when you need to do a middle-of-the-night emergency sheet change! Even if you don’t want to purchase a stand-alone change station for your baby, a change mat is essential to give you somewhere safe and comfortable to change your baby. Having a change mat handy means any flat surface (like a table or even the floor) can become a change station. Newborns can sleep up to 17 hours out of every 24 (it may just feel like a lot less! ), so it’s ultra important to make their little nest as comfy and fuss-free as possible. Invest in linen that’s great quality and washes well. 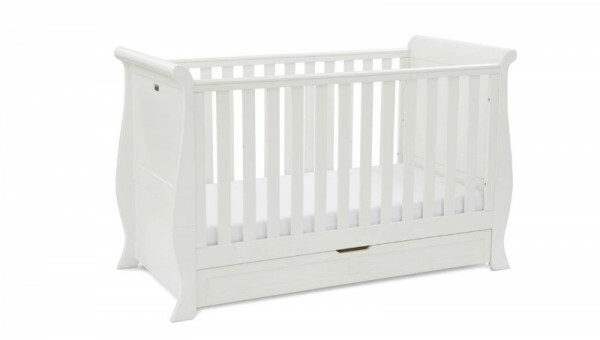 It’s hard to go past crisp, white cotton which will work beautifully with any nursery theme. Silver Cross has the delightful Zoobaloo collection, which is the perfect unisex pick. The fresh cotton comes to life with colourful zoo characters, but it’s subtle enough not to compete with the items you’ll use later to personalise your nursery. Make sure the stroller can be used from newborn to well into childhood – it will save you dollars later having to purchase a new stroller. If you’re a family on the go, choose something lightweight and compact. Think about where you’ll be using your stroller the majority of the time. If you need to flit between the supermarket and off-road walks, find a solid all-rounder. The Silver Cross Zest ticks all my boxes. It can be used from newborn (it actually has the best lie-flat position of any stroller in its class), it weighs less than six kilos, but can take a child weighing up to 25 kilos, so it will get you through all of your baby and child-toting days. It has shopping basket, five-point-harness and rain hood – you’ll be good to go, no matter where you’re headed. If you’re looking for more of a travel system, a pram that can accommodate car seats is the only way to go. It means you can transfer a sleeping newborn with ease, and without waking them! Again, use the stroller buying guide to help your decision; find a pram that will get you through from birth and suits your family’s needs. The Silver Cross Pioneer is a bit of a rock star when it comes to prams. While it’s tough, it’s also lightweight and easy to navigate through tight spots. Included in the package is a carrycot and a seat unit, and it can be used with the Maxi Cosi car seat. Whether you are breast or bottle feeding, you need to be prepped. Breast pads – make sure you throw these in your hospital bag. Breast pump – it’s worth having one handy even if you’re not sure you’re going to use one. You can rent them as well as buy, or borrow from a friend. Nursing pillow – being comfortable while breastfeeding plays a big part in how well your milk flows and your baby drinks. Formula – do some research and choose one that suits your family, and is the appropriate stage for your newborn. Bottles – there are so many on the market, so once again research and asking your family and friends what they recommend is the way to go. Steriliser – it’s recommended to sterilise your baby’s bottles and teats for the first 12 months of their life. You can do it on the stove top, but if you’ll be exclusively bottle feeding it’s probably worth investing in a steriliser. Keep it simple when it comes to preparing clothing for a newborn (although it is easy to go overboard!). Stick with neutral-coloured singlets, bodysuits, and onesies with a few teeny tiny socks thrown in. You’ll no doubt get many items of clothing when your baby is born, but you’ll be surprised how quickly most babies grow out of the really tiny clothes. Also include some muslin wraps, bibs and a stash of cloth or disposable nappies. You won’t want to leave home without it! Make sure it has plenty of compartments and pockets to keep your things and your baby’s separate and within easy reach. Have it ready stocked with breast pads, nappies, nappy cream, wipes and dummies. It will go with you to hospital, and will likely not leave your side for the next couple of years! Now there’s only one thing missing – let the countdown begin!